I'm almost a Superhost in Airbnb! I love Steem and I would like to dedicate all day to post, comment and interact but I think that having multiple streams of income is a great idea in today economy. Steem is my main project, but I cannot live only of Steem and because of the bear market I have been able to earn a lot, I'm happy I know that the investment of time, energy and money (in that order) is going to be worth it in the near future. For a little over a year, my girlfriend and I have been working administrating an Airbnb house. The house belongs to my brother and we are in charge of the cleaning, set up and sometimes we also receive and help the guests. In my brother's house, we have hosted more than 40 groups and I think the average is about 40 USD per group depending on the number of guests and how many nights they are staying. After each reservation, my brother transfers me a commission and he takes care of all the expenses of the house. Last month, in February, we started renting another Airbnb Unit, this one belongs to my parents and we have the same deal as with my brother. My brother's Airbnb Unit reached Superhost status after a few months and today we are very close to achieving this reputation Status on our Bungalow. We have 5 Starts un general, we have completed more than 10 reservations and I think that we have to wait until April 14 to complete the evaluation. Hosting an Airbnb unit is not easy, it requires a lot of preparation, some times it can be very stressful and on rare occasions, you find difficult guests. 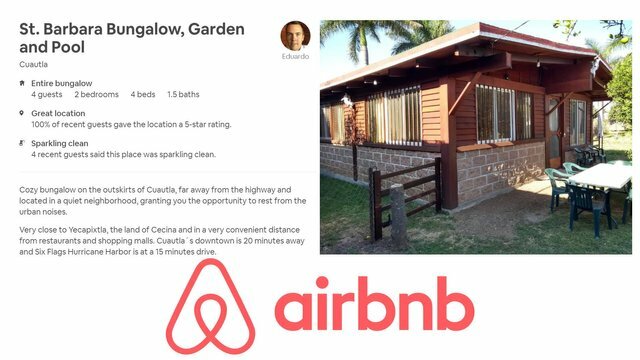 So far we have had more good than bad experiences, the Airbnb community is conformed of people that are educated, have access to technology and in general, they are very polite and respectful. And I have to say that the Airbnb Support and Resolution Center is wonderful, we had a problem with a guest a month ago and they were able to help us in a very good manner. This is my Airbnb Unit, check it out! If the embedded code doesn't show properly follow this link. It would be great to host someone from Steem here! We would have so much fun! Cool. I've thinking about hosting AirBnB in the future. Great info and post. It's a good way to earn some extra income, as I said it is not easy but if you prepare everything in the correct way it is very satisfying. You just got a 2.51% upvote from SteemPlus!